After a scoreless 60 minutes of regulation, Chad Krys’ rare empty-net goal in overtime gave the Terriers a 1-0 win over Vermont in Burlington. Jake Oettinger, continuing his strong play, authored his second consecutive shutout—and third of the season—with a 29 save effort. The Catamounts, who needed a win to keep their playoff hopes alive, had pulled goalie Stefanos Lekkas for an extra skater in the final minute of overtime. However, Krys controlled the puck following a UVM turnover and fired home the winner from the neutral zone. Lekkas, with 43 stops, stymied BU all night including a leg save of Joel Farabee’s attempt at the left post late in the third. A review of the play showed the puck hadn’t crossed the goal line. Earlier in the game Gabriel Chabot clanged a shot off iron. 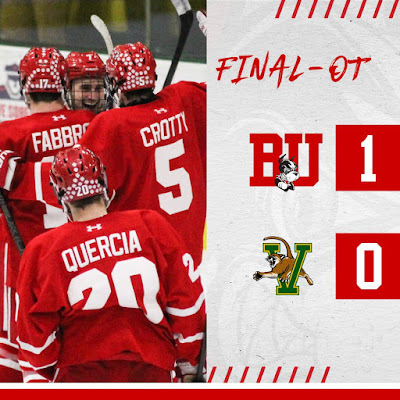 The win improved BU’s conference record to 10-8-2. With BC’s loss to Maine, the Terriers are tied with the Black Bears for fifth place, two points behind Providence with three games left on the schedule. We deserved to win. I thought we played well from the start of the game to the end. And it was nice to see Chad Krys get a goal because he was one of our best players. Great poise by Chad, great recognition. The Terriers and Catamounts complete the weekend series tonight with a 7 p.m. start. 2019 recruit Robert Mastrosimone scored his 21st goal in USHL Chicago’s 5-3 loss to Tri-City. He has 15 points (8G, 7A) in his last ten games. 2019 recruit Liam Gorman’s redirection goal was the game-winner in St. Sebastians’ 3-2 win against Thayer Academy. 2020 recruit Liam Connors added an assist for the #4-ranked Arrows. 2021 recruit Roman Schmidt scored a goal in Team Ontario’s 4-3 overtime loss to Team Quebec in the Canada Games gold medal game. Schmidt and fellow recruit Danil Zhilkin earned silver medals with Team Ontario. Jordan Greenway scored his 11th goal in Minnesota’s 4-1 win gainst Detroit. Nik Olsson scored his first goal of the season in ECHL Adirondack’s 4-3 overtime loss to Maine. Olsson’s victim was former Terrier teammate Connor LaCouvee, who made 31 stops for the Mariners. Former BU captain Peter MacArthur had an assist for the Thunder. #8 Terriers extended their unbeaten streak to 14 games (11-0-3) with a 3-1 win over UConn in Storrs last night. 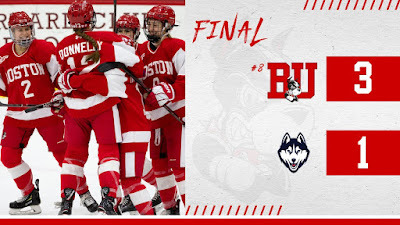 BU received goals from Nara Elia in the first period and from Courtney Correia and Emma Wuthrich in the second to build a 3-0 lead. 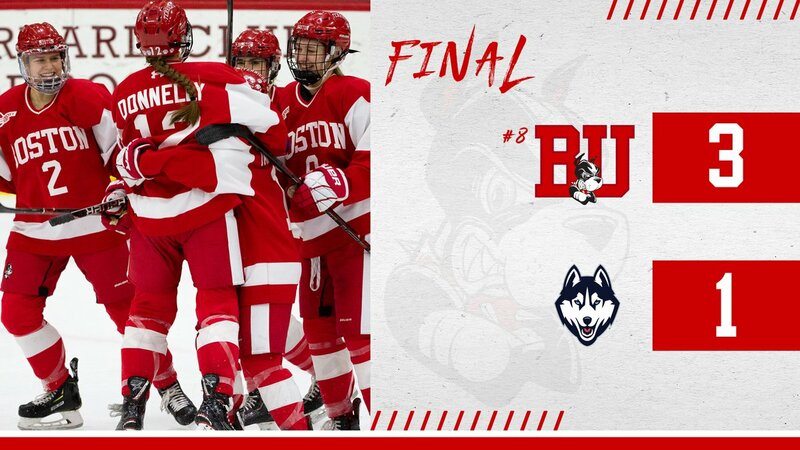 Connecticut broke Corinne Schroeder’s shutout bid in the third period, but the Terrier netminder turned aside 20 shots in the final period and had 35 saves on the night. BU hosts Providence today at 3 p.m. with Senior Day activities preceding the game. Seniors Connor Galway, Mary Grace Kelley and Reagan Rust will be honored. Terriers will need to defeat the Friars while BC loses to New Hampshire to gain the second seed in the Hockey East playoffs.